The former Imperial Capital of Japan — an honor that it held for over one thousand years — Kyoto takes pride in its history and culture. Overflowing with temples, gardens, and narrow alleys through which geishas still tread, the city presents a magical world away from the dazzling modernity of Tokyo. With over a thousand years of history, Kyoto is a paradox of a city that is easily overwhelming in its depth. With so much to see and experience in Kyoto, we spent a whirlwind two and a half days exploring what most appealed to us. This list is by no means definite, and we included at the end additional sites that we wish we had seen if only we had the extra time. Tourists pose in rental kimonos. While we didn't have time to try on the kimonos, we wish we had. Locals in Kyoto allegedly love tourists taking the time to wear the traditional clothing. As most Japanese no longer wear such clothing except for very special occasions, the fact that tourists want to wear such clothing is seen as a reaffirmation of Kyoto's cultural legacy. Coming from the northern Japanese city of Nagano, we arrived in Kyoto by train. From the train station, conveniently located in the middle of the city (ish), you can easily get to most of the other areas of Kyoto by train, subway, or foot. We immediately made our way to the Gion neighborhood — known for its historic buildings, tea houses, and still active geishas — where we checked into our Airbnb. The Airbnb was small and had some slight maintenance issues (wet toilet paper after showering :O), but those issues were well worth it for being in the heart of Gion. Not to mention, the Airbnb offered bike rentals. And baby, Kyoto is meant to be seen by bike. New to Airbnb? Sign up and get $40 off your first Airbnb stay! Jen poses by a tree almost in fully cherry blossom splendor overlooking the Ninen-zaka pedestrian street in Higashiyama. Having arrived late, we spent most of the remainder of our day exploring Gion and the adjacent historic Higashiyama District, generally ooing-and-ahhing at Kyoto's splendor. Aside from keeping our eyes open for the chance Gion geisha spotting, we took the opportunity to explore Higashiyama's Ishibei-koji Lane. Lined with original wooden inns, bars, and restaurants, this street is like stepping into a Miyazaki movie. Note: In our experience you're more likely to see geishas in the evenings if you choose to walk along slightly quieter and less touristy streets; please note, if you see a geisha, act respectfully as there is a growing number of complaints about the ways in which foreigners behave around them. From Ishibei-koji, we walked along the more bustling Ninen-zaka pedestrian street. Lined with restored cafes, tea houses, and restaurants, Ninen-zaka gives a full idea of how the entirety of Kyoto would have appeared before it was modernized. Keep in mind that this street becomes fully crammed during cherry blossom season; however, it does quiet down during the evenings. While in the area, be sure to pay a quick visit to the Hokanji Buddhist temple, which houses a five story tall picturesque pagoda. Hokanji is visible from certain alleys Higashiyama, so finally approaching it and standing beneath it is a sight to behold. Visitors are also able to climb up the pagoda's five stories, which is a rare treat as most pagodas are closed to visitors. After all this walking, we'd built up a mighty appetite. A twenty minute walk from Ninen-zaka brought us across the Kamo River to the characterful Shimokorikichō neighborhood. Only a few blocks in area, Shimokorikichō is an overwhelming gustatory draw of seemingly hundreds of bars, Japanese grills, and cafes in charming small wooden restaurants snuggled in a maze of alleys between a canal on one side and the Kamo on the other. While there is no shortage of good restaurants to experience, 炭火やきとり八十八 was spectacular. A skewer restaurant that sources each of its individual ingredients — including its water — from the highest quality producers and areas, the food left us drooling for more as we devoured skewers of organ meat, fatty pork, beef with green onions, and chicken — not to mention bowls of silken tofu and tall glasses of shochu, a sweeter Japanese liquor, on the rocks. A selection of delicacies, including fatty pork, organ meat, and soft silken tofu. The restaurant offered a private back area where the three of us could eat and drink to our hearts' content. After eating your fill, be sure to walk around Pontocho, which is a neighborhood directly south of Shimokorikichō. Only a block away from the restaurant, Pontocho is also a culinary and nightlife hotspot popular with both locals and tourists alike. Aglow at night with lanterns and verandas from restored classic Kyoto wooden structures, you could easily become lost in all there is to eat and experience. After the previous night of eating and exploring Kyoto by foot, it's time to take advantage of that rental bike and hit up some parts of the city a little further afield. On our first full day in the former capital, we got up with the sunrise to bike over to the Inari shrine to beat the crowds. The Inari Shrine is best known for its thousands of bright orange torii gates that provide a circular path from the base of Mount Inari to the summit. To fully appreciate the beauty of the mountain — as well as getting those dope shots free of crowds — it's important to get to the mountain as early as possible. We got there a little after 6 am, and even then it was starting to fill up. While the shrine was undoubtedly one of the most breathtaking experiences in Kyoto — between the torii gates, the numerous small shrines between the larger temples around the mountain, the views of the city from the peak, and the joy of the fresh mountain air — it was totally thronged with people as we made our way out the main gate at around 10:30 am. Between waking up at 5 am and then biking and hiking for the next six hours, after the Inari Shrine we were wiped — or at least, tired of sightseeing. Fortunately, our stomachs were still down for exploring, and Kyoto is just as pleasing to the tastebuds as it is to the eyes. Our first stop, after a quick rest at our Airbnb, was the 400-year-old Nishiki covered market. Chock full of vendors selling everything from spices to chachkies to grilled squid to ... adorable animal doughnuts!! !, Nishiki market has your itch scratched. Known as Kyoto's Kitchen, the Nishiki market is popular among both locals and tourists, as it is both a functional and fun stop. Need new knives for your kitchen? Nishiki's got it. Want to stop by a quick bite at a restaurant? Go to Nishiki. Want to check out some insanely delicious Japanese street foods? What are you even waiting for?! And if Nishiki doesn't quite scratch your every itch, the Shinkyogoku Shopping Street is just two blocks away and sells a wider range of both edible and non-edible goods. Once you've had your fill of Nishiki Market, make your way over to Kyoto Gogyo Ramen (I told you we were hungry). A specialty joint, this restaurant offers its unique burnt ramen in a variety of broths. The burnt nature of the ramen comes from the restaurant's inclusion of coal burnt lard cooked in a 300 degree oven. The burnt taste gives the ramen a thicker meatier flavor with hints of smoke that ramen normally does not have. While I could see this not necessarily being a selling point for everyone, we loved it. Between being worn out from our day of hiking and cycling, and the fact that it started to rain in the afternoon, this ramen served as a major warming pick-me up. For anyone interested in a unique ramen twist, this is a must eat. After lunch, we took advantage of being on the western side of the Kamo to explore the center of modern Kyoto. While the neighborhood was still nice, we probably honestly could have put the time to better use. But oh well ... live and learn. In any case, our afternoon dilly-dallying was more than made up for with dinner at Tosuiro Kiyamachi, a restaurant specializing in local Kyoto delicacies. Located in preserved traditional Kyoto house, Tosuiro is definitely a splurge purchase, but it is worth every yen. Specializing in traditional local vegetarian food, the restaurant works tofu in ways you could never imagine. Cherry blossom infused tofu, grilled tofu, mixed hijiki seaweed and tofu skin, and asari clams served with soya milk and steamed eggs are just some of the many many courses you get to experience at this restaurant. As my Japanese friend told me, he might love steak, but he could go vegetarian in Kyoto. And even if you don't particularly like tofu, the experience alone of dining in Tosuiro is likely worth the cost. Away from the bustle of downtown Kyoto, on the city's western outskirts, is the Arashiyama District. Famous for its towering bamboo forest — which you've likely seen photos of without realizing — Zen gardens, and plentiful temples, the district is a time-warp must see while in the area. Like the Inari Shrine, it is best to get to Arashiyama as early as possible by train from Kyoto Station as the otherwise tranquil area quickly becomes thronged with tourists — and there's nothing that quite ruins a Zen mood like pushing through hordes of people all trying to get the same perfect camera angle. The best first stop in the district is the Arashiyama Bamboo Forest, which offers an unreal backdrop of towering bamboo verdure. While visually stunning, there is also something to be said about the aural element of the forest, which — if you take the time to listen — is exceptionally calming as the wind plays through the thousands of surrounding bamboo leaves. Of course, all of this is best enjoyed in the early morning or evening, when the crowds die down. In the middle of the day, the forest becomes packed with tourists and Japanese locals posing for wedding photos (seriously, we got there early in the morning and still had to avoid three wedding shoots). Right outside of the Arashiyama Bamboo forest is the Tenryu-ji Zen temple and garden. First established in 1339, the temple is now considered to be the preeminent of Kyoto's five great Zen temples. While the temple itself burnt down several times throughout its existence, its gardens are thought to have remained unspoiled since being designed by Muso Soseki, the temple's founding abbot; this makes the gardens some of the oldest of its kind, and you can tell. Walking through the gardens — past perfectly sculpted imitation mountain lakes, carefully pruned foliage and trees of all kinds, and up and down paths that give you a vista view of the entire temple — you can't help but feel a certain designed calmness suffuse your essence. Perhaps more remarkably, each location I found myself sitting or standing in within the garden offered a beautiful view of a natural scene worth observing. The Arashiyama area also has specialized street food that is a must try. Our collective favorite were the soybean yuma doughnuts, which were warm, light, and had just the right amount of tastiness to keep you energetic, light, and spritely, without weighing you down and giving you the urge to lay down on the clean, Japanese streets for a nap. On the northern side of the Arashiyama Bamboo Forest, the opposite side from Tenryu-ji, are peaceful village-like roads that lead away from the center of the Arashiyama district into the mountains. Along this route are numerous smaller Buddhist temples and shrines that, if you have the time, are well worth visiting due to their own distinctive charms and peaceful serenity. One of the closest of the temples, Gio-ji Temple, is only a ten minute walk away from the bamboo forest. However, it was the Adashinonenbutsu Temple that absolutely blew us away. Housing over 8,000 miniature stone statues for the abandoned and forgotten souls that still reside in the complex. Originally serving as a massive graveyard, the site slowly grew into the temple it is today. Due to the sensitive nature of the sight, photography is not allowed, but take our word that it — and its associated bamboo forest further up a hill above it — are truly a must see in the area. Jeremy and Dennis getting their Buddhist grub on while sitting on the floor in a traditional manner. After strolling far and wide through Arashiyama, it's time to treat yourself to another sumptuous meal. The Shigetsu restaurant, which is situated within the Tenryu-ji Zen garden, is listed in the Michelin Bib Gourmand and, as fitting its location, serves vegetarian Buddhist monk cuisine. That means that, like Tosuiro, the food is very tofu-heavy; but my God, is the food good and truly unique as Kyoto, with its centuries of Buddhist history, has absolutely perfected food for monks. Additionally, the food is served in the traditional manner of multiple small dishes and a side of rice. For the complete Buddhist monk experience, the food is served while you are seated upon the floor in one large communal banquet hall. Shigetsu serves lunch from 11:00 AM to 2:00 PM, and it requires a reservation that can be made at its website. Reservations need to be made at minimum three days in advance, but you should book as early as possible as it is in high demand (we booked a month in advance). As a final must-see location in Arashiyama, stop by the Kimono Forest behind the Arashiyama Station. The "forest" is made of hundreds of samples of kimono cloth covered in transparent covers, highlighting the richness of tradition and color that went into older Japanese designs. Additionally, from the station, you are now close to the various buses that will take you back towards the northwest side of Kyoto to see the stunning Golden Pavilion. Not pictured: the thousands of tourists swarming behind Jen waiting for a similar photo. Pictured: a perfectly placed heron on a island in front of the pavilion. The Golden Pavilion is a portion of Kinkakuji, which was built as a retirement villa for the Shogun Ashikaga Yoshimitsu in 1397. Today, Kinkakuji functions as a Buddhist temple, with the Golden Pavilion being the main focal point for the seemingly endless army of tourists that pass by it. This is not an exaggeration, be prepared to suffer through literal swarms to get the perfect photo of the Golden Pavilion appearing tranquil, because the surrounding land is anything but. Having said that, the beauty of the Golden Pavilion, its landscaping, and Kinkakuji overall, is that it still manages to radiate harmony even with a non-stop flow of tourists. Covered in pure gold leaf on every side except for the basement floor, the Golden Pavilion shines gloriously in the sun while its reflection simultaneously glimmering out from the pond that wraps around it. In balance to the Golden Pavilion, the eastern side of Kyoto is home to Ginkaku-ji, or the Silver Pavilion. Built following the construction of the Golden Pavilion by Ashikaga Yoshimitsu's grandson as his own retirement villa, Ginkaku-ji was never actually covered in silver, instead featuring more subdued whitewalls and dark wood. We ultimately did not visit Ginkaku-ji, but instead we walked along the Philosopher's Path which, if taken to its terminus, leads between Ginkaku-ji and the Nazenji Temple. After a hectic day of sightseeing, the Philosopher's Path is an ideal destination at which to unwind. A little over a mile long, the cobblestone path follows a canal. During cherry blossom season, the path explodes in bright pinks and whites as hundreds of trees that run alongside it all come to life. While we missed the blossoms by literally three days, we still enjoyed the calming scenery, the delicious sesame soft serve that was being sold right off the path, and a well-fed family of street cats we came across (because, boy, do the Japanese seem to love their cats). Kyoto is not a city to be seen in two days; the sheer abundance of noteworthy shrines, gardens, museums, historic sites, drool-worthy restaurants, street foods, and general atmosphere to appreciate would truly take years to appropriately experience, let alone appreciate. Having said that, we are fully aware that we missed out on a number of sites worth seeing. Below is a quick run down of three particular attractions we wish we had had time to see. 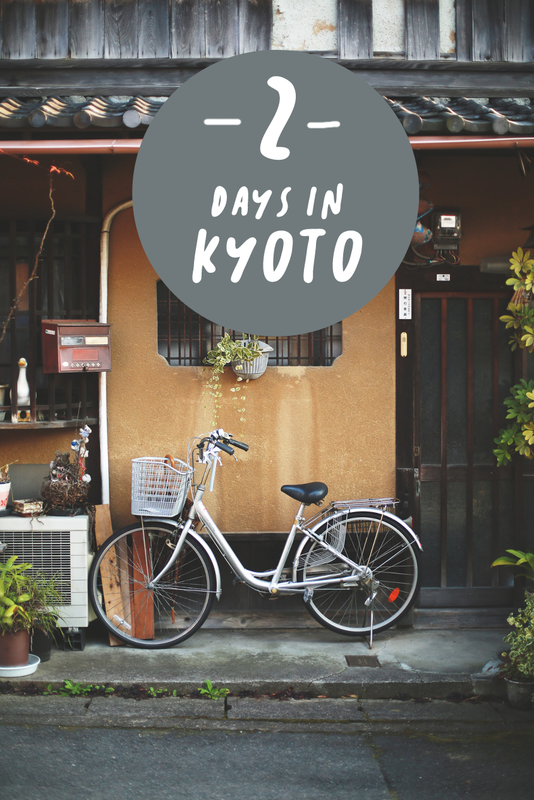 And please, let us know in the comments what your favorite go-to spots in Kyoto are. Ryoanji Temple: A temple belonging to the Myoshinji Branch of the Rinzai sect Buddhism, Ryoanji was originally a villa. Now a temple of almost 600 years, Ryoanji is a World Heritage site. It is particularly famous for its rock garden, which is apparently the most famous in all of Japan, and it also hosts a famous tofu restaurant. Nijo Castle: Built in 1603 as the stead of the newly formed Tokugawa Shogunate, the Nijo Castle remains as the preeminent example of feudal Japanese castle palatial architecture. The structure served alternatively as a residence and military base until it was donated to the city of Kyoto and became a park in 1893. Today, the castle is a World Cultural Heritage site and contains three main areas: the main circle of defense, a secondary circle of defense, and gardens that encircle the two. The castle, while appearing fully austere from the outside, is lavishly opulent inside. Kiyomizudera Temple: Known as the "Temple of Pure Water," this temple dates back to 780, when it was established at the site of the Otowa Waterfall in the forested slopes in eastern Kyoto. Today, the temple complex stands above the Higashiyama District, making it a close walk from Ninen-zaka. The overall complex is huge, featuring multiple shrines, luck-granting waterfalls, and staggering views of cherry blossoms and maples arraigned below you, making this an extremely scenic spot for both the spring cherry blossom season and fall foliage. Sagano Scenic Railway: For those templed out who prefer a more natural getaway, the Sagano Scenic Railway offers an alluring and slightly different twist on visiting Kyoto. Starting at Arashiyama, the scenic railway runs slow old-fashioned train cars along Kyoto's Hozugawa River towards the rural town of Kameoka. The 25 minute ride offers fabulous views of the mountains and forested rivers outside of Kyoto, and is a popular option in the fall for maple tree foliage. Note that trains do not run from December 31 through the end of February.